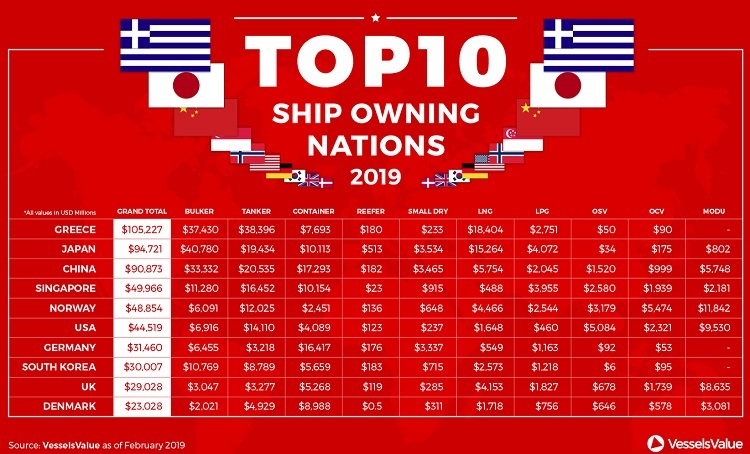 It's no surprise that Greece tops the world for shipowning, but China has seen the biggest increase in value out of the top 10, The Maritime Executive online portal reported, according to VesselsValue. The Greek fleet has increased its total value by over $5 billion in one year. This is the second biggest increase in value for any of the top 10 shipping nations. The total asset value of the Greek owned fleet has topped $100 billion, a significant milestone. The increased fortune comes from growth in LNG ordering and a tanker value uptick. Greece has moved into pole position as owning the highest valued LNG fleet in the world, up from $13 billion at the start of 2018 to $18.4 billion. This puts Greek owners ahead of Japan, whose fleet comes in second at $15.2 billion. Their biggest loss comes in from the mobile offshore drilling unit (MODU) sector, with George Economou’s drill ship sell off and lower asset values overall which have depressed the net value. Japan remains in second place of the top owning countries. The rebound in bulker values was the largest boost to the end of year fleet valuation, followed by tankers and LNG carriers. Japan based companies saw the largest addition of value from LPG carriers, a segment in which many other nations saw an erosion of value. The Chinese fleet has seen the largest increase in value for any of the top 10 highest valued fleets. 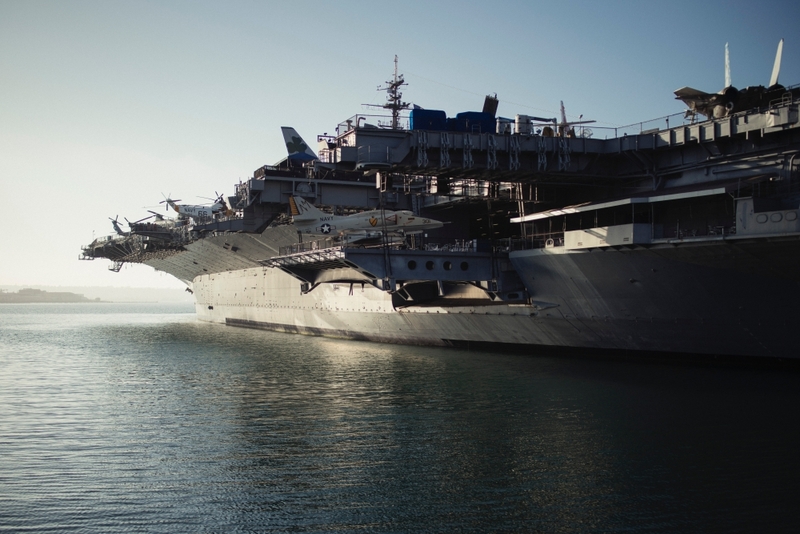 An additional $6.3 billion has been added, bringing up the total fleet value to just over $90 billion. At the same time, they suffered the largest drop in total container fleet value. China has been responsible for much of the incremental demand in LNG consumption, so it's not surprising to see companies based here see a significant increase in value in this market. Asset values surged in line with spot and term market returns. COSL leads the way on the offshore front, owning the fourth highest number of vessels in the world and sixth most valuable. The Chinese government owns the next highest at 52 with a much lower value of $332.6 million. Tianjin Offshore owns the second most valuable fleet of $1.085 billion. Singaporean owners have jumped up a spot into fourth place, increasing their fleet value by $3.1 billion. They now sit comfortably above the U.S. and Norway yet are a long way from a podium position. The majority of their increase comes from their container growth, most notably attracting the Japanese container liner merger ONE to locate to Singapore. Norway maintains pole position as the number one home for offshore assets. Over $20 billion in assets puts it above U.S.-based owners, who clock in at almost $17 billion. The country maintains a sizeable presence in the tanker markets as well. Despite Solstad’s troubles, its offshore prestige is still reflected by its ownership of the world’s second most valuable fleet of AHTS and third most valuable fleet of PSVs, despite having the sixth highest in number. Germany’s fleet continues to contract year on year, with the majority of this year’s woes coming from their container vessel types. Down a further $1.7 billion, their container fleet continues to shrink from high seller and demolition activity. China now takes the lead as the highest valued container fleet owner, cinching the crown with $17.3 billion versus Germany’s $16.4 billion fleet. It has been a very positive year for South Korean owners who have increased their fleet value by over $5 billion in the three largest markets of bulkers, tankers and container ships. Container ship assets comprised over $3 billion of the value added. One interesting trend is the decline in LNG asset values held by Korean owners, which is due in part to the removal of some older, steam powered units from service. The U.K. slips down a notch from its 2018 slot to ninth place. The ownership by segment is diverse, and no one flagship market decline is responsible for the drop. There could be some risk aversion ahead of the country’s planned exit from the E.U. that is driving investment to other locales. The Danish fleet is heavily dependent on the container markets, but this segment saw little volatility, adding modestly to the net value under the Danish masthead. However, weakness in clean tanker asset values dragged down the total value of the fleet. The country clings to its top 10 ranking though.